Special Assistant to the governor on Public Communications and New Media, Lere Olayinka said in a statement issued on Sunday, that the governor chided the Northern youths for making such pronouncement at a time Nigerians needed to join hands together for the development of the nation. “I have said it times without number that Nigeria is now more divided than ever in the last two years. 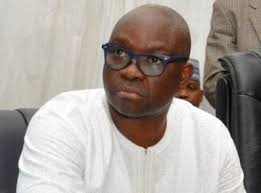 “It is for unguarded utterances and actions like these that our unity as a country is no longer like before”, Fayose submitted. He advised the President and his henchmen to live up to expectations and ensure a more united Nigeria in order to avoid an embattled future for the unborn children.